Escargot is the French word for snails – but their origins trace way further than Marie Antoinette. Archaeologists have dug up evidence that prove humans have been eating snails since the Stone Age. From ancient China to super-ancient Libya, this delicacy is nothing new to our species. But experts predict that escargot really took off during the Roman empire. This high-protein, low-fat treat is still popular in countries like France, Spain, and Portugal. Don’t be surprised – or intimidated – if it’s offered as an appetizer on your next Euro-trip. Though it sounds like a scrumptious dessert, sweetbread is actually the thymus and pancreas glands of a young animal (usually calves or lambs). It’s unclear how this delicacy got its name, but it probably has to do with the fact that it tastes sweeter than other kinds of meats. Sweetbread glands disappear from an animal once they’re taken off a milk diet, so supply is limited and very expensive. 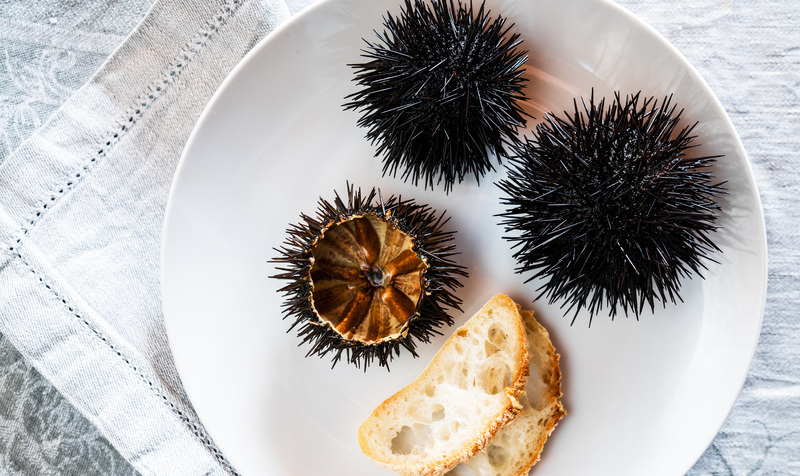 Sea urchins might be the last sea creature you’d consider edible; but once the uninviting exterior is broken, these bad boys are quite delicious. The interior of the sea urchin, which is called “the roe,” can retail for over $450 per kilogram in Japan. Also known as “Uni” (oo-nee), the roe is commonly served raw as sashimi or as sushi. In Italy and other Mediterranean countries, the roe is often cooked to add flavor to fish and pasta sauces. Thousand-year eggs (aka century eggs) date back more than 600 years to the Ming Dynasty, when a farmer found duck eggs in his yard under slaked lime, a natural preservative. The farmer was such a fan of the taste that he later created his own batch. Although the name suggests otherwise, thousand-year eggs are only fermented for about 100 days in a mixture of lime, salt, black tea, and fresh wood ashes. If you go to Cambodia, there’s a couple things you’ll have to do: get yourself a travel visa and eat a fried tarantula. These arachnids are not only a delicacy but a popular attraction for tourists, who enjoy snapping photos of themselves devouring spiders. Dating back to the Vikings, lutefisk is a fish dish, soaked in lye and boiled for a distinctive gelatinous texture. It’s believed that the recipe originated when a fisherman found a cod fish covered in lye and ashes after Vikings burned down a Swedish fishing village. After rinsing and boiling the fish, a courageous villager gave it a taste, and declared it edible. Today, lutefisk is traditionally served around the holidays in Swedish and Norwegian households. Considered a delicacy in rural communities, Palm Weevil larvae are high in protein, potassium, and calcium. Researchers have found that the African palm weevil has actually played a substantial role in the history of human nutrition due to an abundance of amino acids. Popular in Nigeria, Papua New Guinea, Malaysia, and Peru, this delicacy can be prepared in many ways: straight from the tree, deep-fried in flour, roasted on skewers, and even wrapped like a tamale. Influenced by Chinese and Spanish cuisine, Pinoy food is known for unique dishes; however, this one takes the proverbial cake. Considered a remedy for strengthening the knees, Balut is an incubated, fertilized duck embryo, boiled alive and often eaten in the shell. The preferred age of the embryo is 16 to 18 days but the cooking process only takes about 20 to 30 minutes. Cuy (pronounced “kwee”) is fried or roasted guinea pig, and one of the most famous Peruvian specialties. Cuy has been a staple of the Andean diet for nearly 5,000 years and is so popular it even has its own national holiday on the second Friday of October. Although they are a delicacy in nearby Ecuador and Bolivia as well, it’s estimated that around 65 million cuys are consumed annually in Peru alone. If you’re looking for more traditional treats, check out our guides to the best food in Japan, South Africa, and Spain.